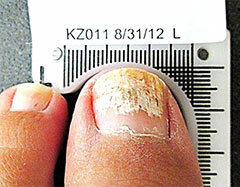 Are you embarrassed about going barefoot at beach, do you use nail polish to hide yellow, discoloured or crumbling nails? 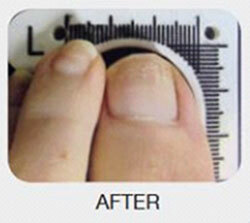 You may have a condition called Onychomycosis, or a fungal nail infection. What started as a knock to the nail, or a small patch of discolouration is now an unsightly object at the end of your foot- and you want rid, right? The great things is, once you get the right intervention, you’ll be able to show those feet off again with pride- and your partner is going to appreciate it too- no more sharing those fungal germs at the end of the bed! 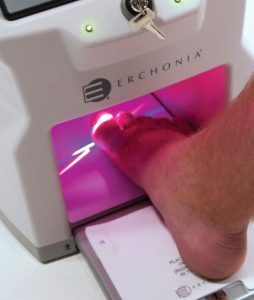 Lunula Laser is a cold laser therapy that destroys the bugs that cause fungal nail infections, without the need for nail paints, oral medication or uncomfortable hot laser therapies. It is safe, highly effective and pain free. Research, clinical trials and anecdotal evidence indicates that this laser provides far better patient outcomes than by using hot laser therapy which other clinics use. 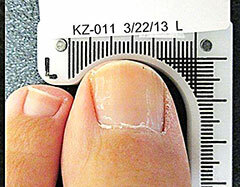 The machine is computer automated to ensure consistency of coverage of the nail. Hot lasers are generally handheld and run the risk of inconsistent application. 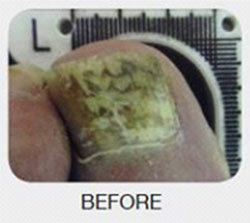 Our experienced team of podiatrists will diagnose whether your nail is infected or not. If need be, we can perform a simple 5 minute lab test to confirm diagnosis. We will run through your treatment options to decide what the best option is for you. You’ll also be coached on how best to self manage your issue so that it doesn’t return. Following successful treatment, you’ll leave confident in the knowledge that in a few months you’ll be proud about the appearance of your feet.